The 2018 budget of the Government of India has taken a number of initiatives to empower women in the country. These include increased gas connections through subsidies to 80 million women under the Pradhan Mantri Ujjwala Yojana (from the earlier 50 million) and a 37% increase in loans to women Self-Help Groups (SHGs). These initiatives are expected to contribute towards women’s social and economic empowerment. However, it is critical that the government strengthens its commitment to women empowerment and continues to introduce and support programmes that enable greater financial inclusion for women. The Financial Inclusion Insights Wave IV India report reveals a significant gender gap in terms of access to formal financial services. As of June, 2017, 33% of women had active bank accounts as compared to 47% of men. The agency banking channel, which has been the backbone of financial inclusion efforts in India, is yet to succeed in serving as many women as men. 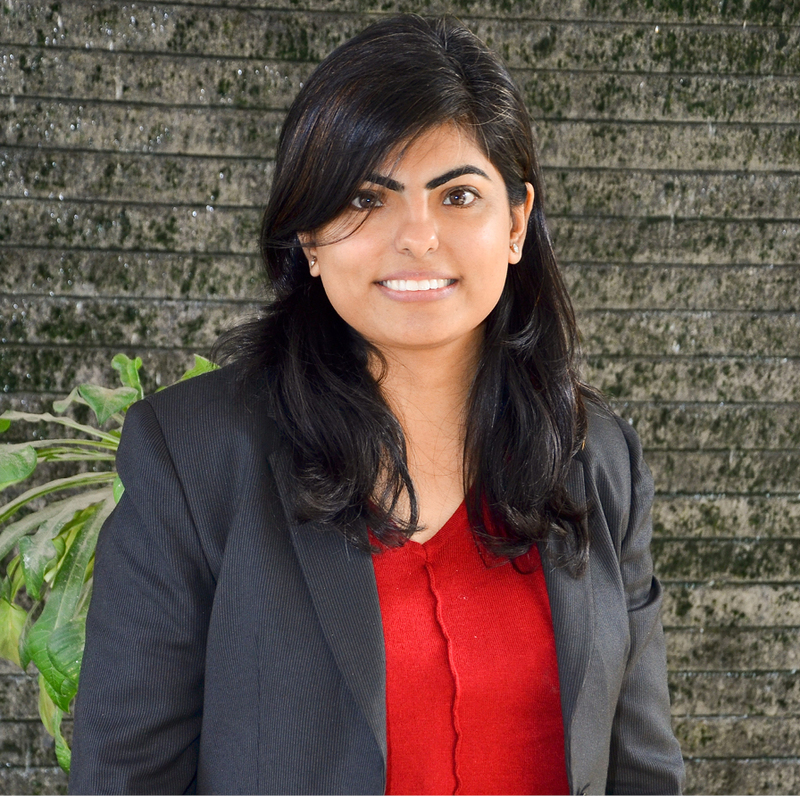 As per the ANA India Wave II study1, women comprise 43% of the customer base of agents. The study highlights a vast gender imbalance in the agency banking channel with only 8% of agents being women2. As per the Global Gender Gap Report 2016 published by the World Economic Forum (WEF), India ranks 87 out of the 144 countries on its overall global index. The rank is dismally low at 136 for the sub-index of ‘Economic Participation and Opportunity’ for Women. 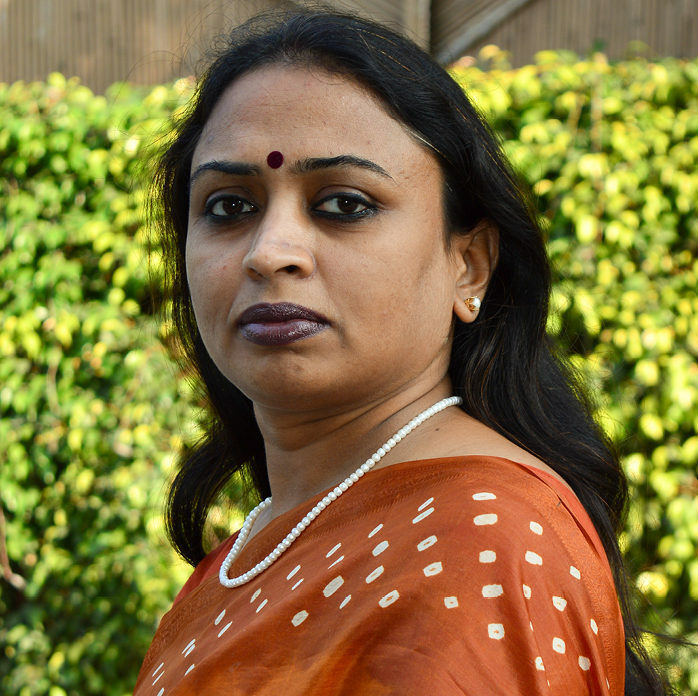 There is a high unmet need for women entrepreneurs in India to get adequate access to finance for their business. However, various studies across the world have established that women make ‘good banking customers’ with lower risk. The Financial Inclusion Insights Wave IV India report reveals that only 6% of Indian women are advanced active account users3. This indicates that in India, women with bank accounts do not utilise them to their full potential. Women find female agents easier to approach, more trustworthy, and better at maintaining confidentiality as compared to male agents. ANA data shows that half the customers served by a woman agent are women, while two-fifths of customers that male agents serve are women. 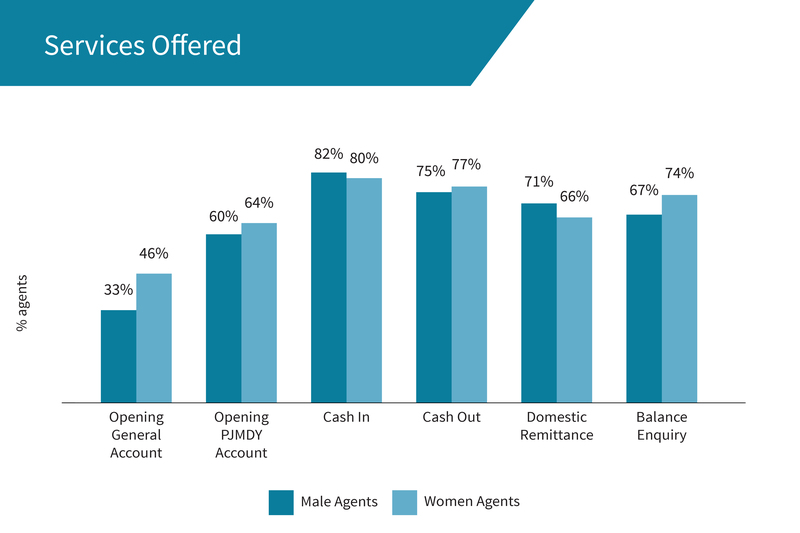 This shows that a woman agent is more likely to have women customers than a male agent. Clearly, more women agents on the ground are likely to boost the agenda of financial inclusion. There is a myth that women are less enterprising than men. The ANA data reveals a contrary reality. The portfolio of services that women agents provide is quite exhaustive. At the country-level, the median number of services that women agents provide is seven, which is slightly more than male agents, who provide six services. The proportion of women agents who provide various services is roughly equivalent to, or greater than the services that male agents provide (see below graph). The one exception is domestic remittance, which is mainly an urban phenomenon. The presence of women agents in these areas is much lesser (metros – 4%, non-metro urban – 6%) compared to rural areas (10%). Eighty percent of women agents provide a Government-to-Person (G2P) facilitation service, such as insurance registration, pension registration, scholarship registration, subsidy registration, and linking the Aadhaar card, among others. The range of services is much higher when compared to male agents (68%). This indicates that women agents are more likely to serve customers even if the transaction does not generate as much revenue 5. In terms of business viability, at the country-level, women agents generate less revenue. However, they also incur less operating expenses when compared to their male counterparts. 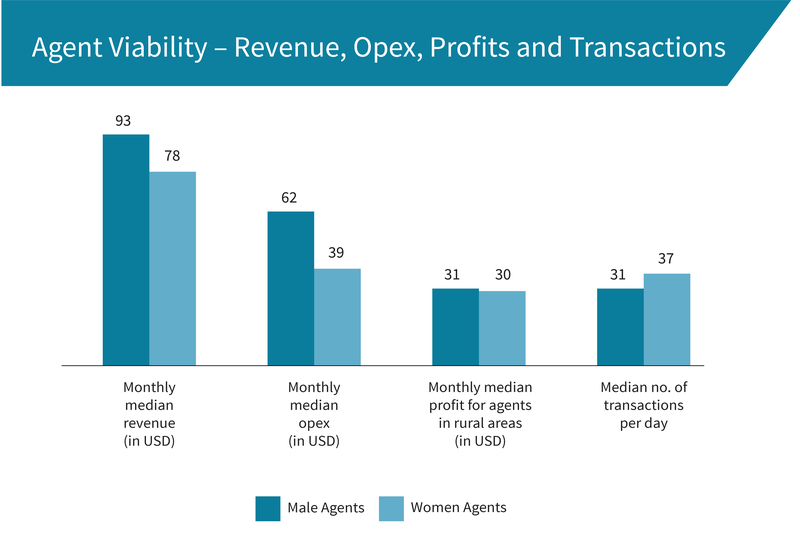 In rural areas, where almost 71% of the women agents operate, there is almost no difference in their profitability levels as opposed to male agents (see below graph). Additionally, the proportion of women agents (33%) who incur losses or achieve break-even is actually a little lower than male agents (34%). MicroSave’s research indicates that women agents find it difficult to establish a good rapport with the staff of service providers, who are mostly male. For example, women agents cited instances where they struggle to get answers to their queries from the support staff. This results in forfeiting new opportunities that may arise from new services and products. Furthermore, women agents often cite challenges in handling a difficult customer, particularly men. Women agents emphasise that previous experience of dealing with customers is a prerequisite for running a successful agency business 6. More research will help us get granular data on women agents and the advantages they bring to the industry. There is a need to understand this space to create a more effective business and support case for women agents. SHGs in the country offer value in terms of outreach and have a history of financial inclusion. 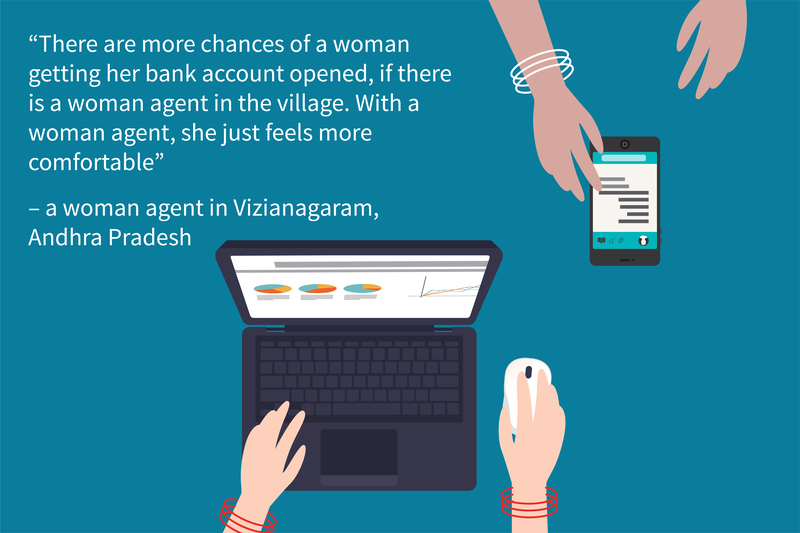 Digital finance channels can make use of the SHG model, at scale, to get more women agents in villages. GIZ’s Rural Financial Institutions Programme’s (RFIP) and NABARD’s Bank Sakhi pilot has indicated positive results. However, neither initiative has scaled the engagement and management of SHGs as banking agents. Policymakers can set gender-centric criteria to define an “adequate number or share” of women agents. To bring parity in terms of onboarding efforts, monitoring, and support offered to male and female agents, we could think of introducing soft skills on gender sensitivity through agent training sessions imparted to male agents. It will be crucial to understand how we can utilise various government programmes that focus on women, such as ASHA, Anganwadi workers, and scholarships, to expand the base of women agents in the country. In India, more than 137 million women are still excluded from formal financial services. There is evidence that women agents handle clients more professionally and perform at par with male agents in terms of business. In fact, women agents do more transactions and are preferred by women customers. These developments together indicate a business value proposition that we simply cannot ignore. 1The State of the Agent Network India 2017 report, based on the Agent Network Accelerator (ANA) Wave II survey, is a nationally representative study of the business correspondent (BC) agent network in India. 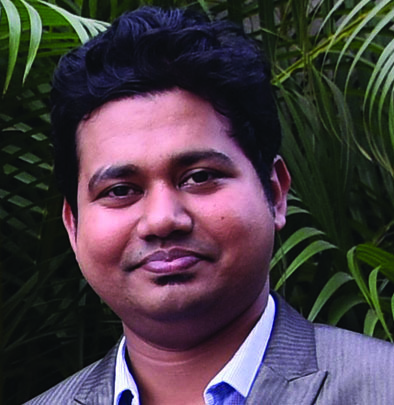 2Agents who offer digital financial services are known as business correspondent agents in India. We have referred to business correspondent agents (BCA) as agents and women BCAs as women agents. 3 Advanced active account users: Users who use a financial account for services other than basic or P2P services. In the FII study, in the case of mobile money, airtime top-ups are not considered an advanced use. 5 The commission income from G2P facilitation is lower than CICO charges; MicroSave analysis and review of commission structure of providers in public domain.